India's current account deficit (CAD) crisis is generating high level calls to unleash solar as a solution. While the National Solar Missions goal of 20 GW of solar by 2022 grabs all the headlines, a lesser known target holds the real impact. The mission has a goal of deploying 20 million systems to serve 100 million people by 2022 - roughly one third of all un-electrified people in India. This off grid market already accounts for roughly one third of solar manufacturing demand in India but is held back by another drain on the country's resources - kerosene subsidies. As India looks for solutions to the CAD crisis, including reducing foreign oil imports, kerosene subsidies should be on the chopping block. To look for a good reason why India should deal with these subsidies it need look no further than neighboring Bangladesh. The country is an off grid solar pioneer that is rapidly redefining energy access. When the Bangladesh solar program was instituted in 2003 its original goal was 50,000 systems by 2008. They reached that target three years ahead of schedule with $2 million less than they projected. 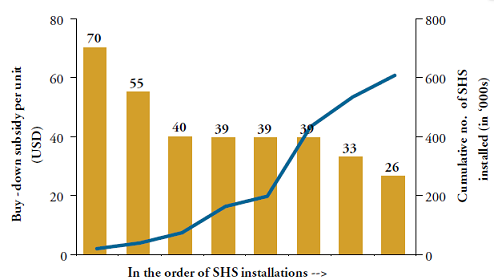 Now after easily surpassing 1 million solar home system deployments last year the country is projected to ramp to 4.2 million by 2014 (as of January 2013 they were halfway there). 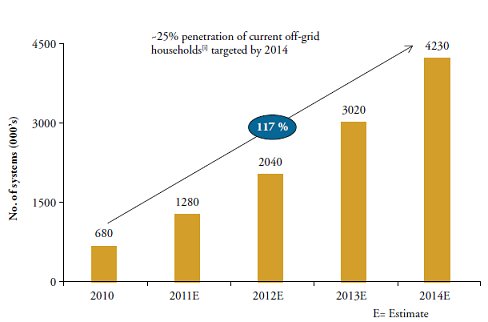 That's 25% of all off-grid households, that's scale, that's why small is big. The same excellent Lighting Asia report where this information can be found paints a very different picture for India. By 2011 India had only installed 1 million solar home systems. This in a country with a population eight times the size of Bangladesh means it had only reached roughly 4% of the off grid population. Even Nepal has reached 10% of its off grid population with solar. So what gives? Why is India doing such a poor job compared to its neighbors? There are a lot of answers to this question but the most timely for Indian policy makers is the subsidies it doles out to Kerosene. Bangladesh (and Nepal) don't subsidize kerosene; India does - obscenely. As a result it is the dominant fossil fuel in rural India and the poor pay a huge amount to use it - $2.2 billion annually according to Lighting Asia. But it's not just people who pay dearly for this dirty fossil fuel - the Indian government pays $4 billion every year to support Kerosene, half of which subsidizes lighting services. That's a giant albatross on the increasingly shaky finances of the Indian government. The good news is there are ways to end kerosene subsidies that don't harm the poor. From Michael Liebreich's sunset credits to direct cash transfers, smart people have been looking at tackling this problem for a while. Now the Indian government looks to be moving forward on the latter with a trial run under way in Mysore as we speak. A move that is followed closely by the Parikh commission, which although delayed, is set to lower subsidies in a month's time (and in so doing save 10% of the entire subsidy bill the government incurred last year). Once these subsidies are removed, or redirected, the economics of solar will be unleashed for a much deeper strata of the population. It also means the poor will have the choice to spend their money on far superior and cleaner lighting products that aren't forced to compete with a heavily subsidized, and heavily polluting, alternative. It's cliché but it's really win-win. The best part is that removing these subsidies does not imply simply shifting subsidies to solar. In Bangladesh they have steadily ratcheted down the end user subsidy (with the invaluable help of consumer finance) while growth has skyrocketed. In fact, they now believe they could remove the subsidy entirely and not affect market growth. It's worth saying that again, off grid solar in Bangladesh no longer requires subsidies to maintain dramatic growth rates. Of course any number of other things are needed in addition to dealing with Kerosene subsidies to move India's off grid solar policy towards a place where it actually drives deployment rather than scares entrepreneurs off. From avoiding technology specifications, to providing consumer finance, to streamlining processes for distributing subsidies the solar mission has a ways to go (For an excellent set of ground truthed suggestions check out SELCO's policy paper on the National Solar Mission here). But a crisis is a terrible thing to waste. It's time to use the CAD crisis as an opportunity to move beyond kerosene subsidies. It would be a first, and much needed step, towards letting the sun shine on rural India.